MANILA, Philippines - The Bb. Pilipinas 2017 coronation night happens tonight, April 30, at the Smart Araneta Coliseum in Quezon City. Check out on this page for the livestream video and coverage for the crowning of successors of the 6 reigning queens. As reported, ABS-CBN got the sole and exclusive rights to the live coverage of the 54th edition of Binibining Pilipinas coronation night. The agreement with Binibining Pilipinas Charities, Inc (BPCI), the organization that owns the pageant, stated that other media outfits will be allowed to post updates after ABS-CBN's delayed telecast. 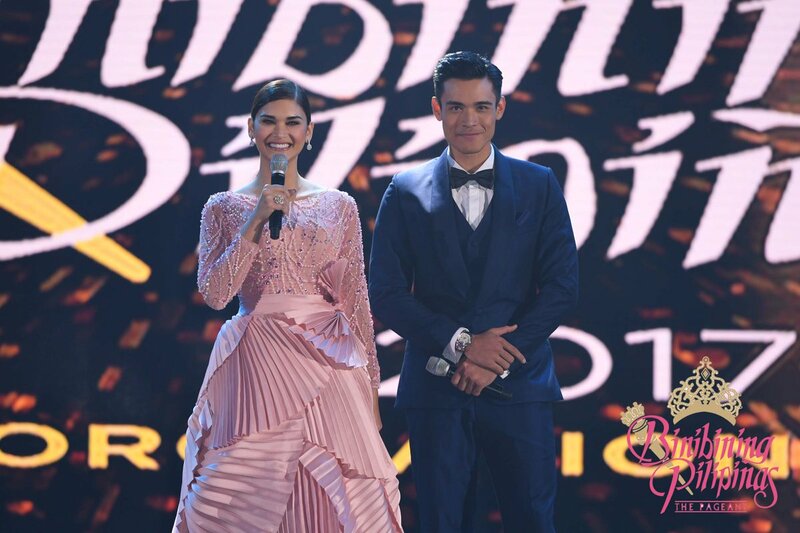 The Kapamilya Network is scheduled to air the delayed telecast at 10:15 p.m. and expected to last for three hours or around 1 a.m. (Monday, May 1). On its TFC website, it says that Bb. Pilipinas Coronation Night will be available on Pay-Per-View (PPV) and ABS-CBN Streaming Simulcast at 10:15 p.m. Pre-order here (http://beta.tfc.tv/category/live). Livestream of Bb. Pilipinas will be available also via iWantTV. The Binibining Pilipinas 2017 will headline the crowning of successor of Miss Universe 2016 Top 6 Maxine Medina. Also, Miss International 2016 Kylie Verzosa, Miss Intercontinental 2016 Top 15 Jennifer Hammond, Miss Supranational 2016 Top 25 Joanna Louise Eden, Miss Grand International 2016 1st Runner-up Nicole Cordoves and Miss Globe 2016 3rd Runner-up Nichole Marie Manalo will relinquish their titles to their respective successors as well. Forty lovely candidates are vying for the main titles and two runner-up positions. Bb. Pilipinas 2017 is hosted by Miss Universe 2015 Pia Wurtzbach together with Miss Universe 2010 4th runner-up Venus Raj and actor Xian Lim. Who will be crowned the Miss Universe Philippines 2017? Tell us in the comments section below. 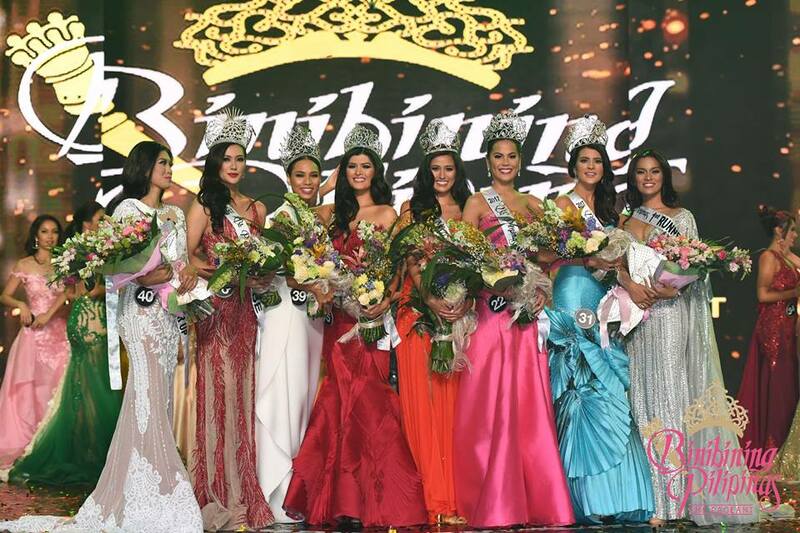 MANILA, Philippines - (Updated as of 1:30 a.m.) The six reigning Bb Pilipinas queens finally crowned their successors in the grand coronation night on Sunday, April 30, at the Smart Araneta Coliseum in Quezon City. The full list of winners and updates are available on this page as announced online. According to Bb. Pilipinas website, this year’s roster is composed of local pageant winners, degree holders from top schools, honor graduates, artists, sports and fashion enthusiasts, and working professionals who excel in their respective fields. Representing various provinces in the country, the official candidates bested hundreds of aspirants that went through rigorous screenings and interviews in January. For the first time in Binibining Pilipinas, the winner of the text votes will be included in the Top 15. Bb Pilipinas 2017 Coronation Night will be aired via delayed telecast on ABS-CBN on Sunday at 10:15 p.m. The show will last for three hours and expected to finish around 1 am. on Monday, May 1. Among the judges at the coronation night are actor Paulo Avelino, volleyball player and TV host Gretchen Ho, newscasters Mitzi Borromeo and Ted Failon and PLDT Group's Eric Alberto. MANILA, Philippines - The Philippine Institute of Volcanology and Seismology (Phivolcs) reported a magnitude 7.2 earthquake that shook parts of Mindanao on Saturday morning, April 29, 2017. Screenshot from Phivolcs earthquake advisory. The exact time of occurrence was recorded at 04:23:14 a.m. with epicenter at 05.02°N, 125.24°E - 053 km S 30° W of Sarangani town in Davao Occidental. The earthquake that occurred has a tectonic origin with 57 km depth of focus. The strong quake was felt at Intensity V in General Santos City; Koronadal City; Santa Maria, Jose Abad Santos, Don Marcelino, Balot Island, Davao Occidental; Polomolok, Tupi, South Cotabato; Alabel, Malapatan, Glan, Sarangani; and Palimbag, Sultan Kudarat. Also felt in Intensity IV in Davao City, Cotabato City and Zamboanga City. It was at Intensity III in Cagayan De Oro City and Intensity II in Kidapawan City. The quake was measured at Instrumental Intensities: Intensity V in General Santos City; Intensity IV in Zamboanga City and Intensity III in Cotabato City. Damage and aftershocks are expected after the tremor. After the quake was reported, PHIVOLCS issued a TSUNAMI ADVISORY for coastal communities fronting Celebes Sea (Sarangani, Davao Occidental, South Cotabato, Davao Oriental and Sultan Kudarat) where sea level disturbances were expected. The occurrence of sea level disturbance was confirmed by records of the Sarangani sea level monitoring station showing a drop of approximately 30cm and a maximum rise of approximately 10cm wave height relative to normal sea level. It is expected that the continuing sea level fluctuations in the area associated with this event will no longer exceed this recorded wave height. "PHIVOLCS has now cancelled its Tsunami Advisory as there is no longer a tsunami threat for this event," the latest bulletion stated. MANILA, Philippines - Popular online video community website YouTube officially opened the YouTube Pop-up Space Manila on Friday at the Bonifacio Global City (BGC) Arts Center. Pop-up Spaces is a YouTube initiative created to support creative communities around the world, and an investment in the development and growth of these content creators in line with the mission of YouTube Spaces: learn, connect, and create. The first ever YouTube Pop-up Space Manila will operate until May 1 and will allow YouTube creators to learn about video production, collaborate with other creators, and give them the production tools they need to realize their creative goals. They can use the facilities for free. Through the Space, creators can access all the latest audiovisual and editing equipment to produce original and innovative digital video content for their own YouTube channels. The Filipino YouTube creator community is one of the world’s most vibrant, and in the past year alone, the amount of content uploaded to YouTube in the Philippines has grown by a staggering 150%, while watchtime on mobile in the Philippines has grown 65% year on year. To support this incredible community of YouTube creators as well as the next generation of local talent, YouTube is excited to be bringing in a physical pop-up presence where creators can interact. The YouTube Pop-up Space encompasses two studios— one music themed and one themed after a traditional Philippines street with a Jeepney. There is a lounge area and multiple meeting rooms for creators to use. Over the next four days, YouTube will organize events, workshops, and networking events in the Space’s auditorium and classrooms that are open to all YouTube creators locally. YouTube previously opened Pop-up Spaces across Asia in cities like Bangkok, Jakarta, Seoul, Taipei, Sydney. Permanent YouTube Spaces are presently open in Tokyo, Los Angeles, London, New York, São Paulo, Berlin, Paris, Mumbai, and Toronto. Since the first YouTube Space opened in 2012, more than 150,000 creators have visited the Spaces globally, creating over 10,000 videos from their visits. Videos created at YouTube Spaces worldwide have amassed almost 2 billion views thus far. You can follow the latest updates about YouTube Pop-up Space at #YTPopupSpaceMNL to stay informed of the latest news about activities and events. Find more YouTube creator resources at youtube.com/creators and learn more about the YouTube Spaces across the world at youtube.com/space. Ladies, if you’ve given up on finding a partner in the Philippines, perhaps you need to go the distance. 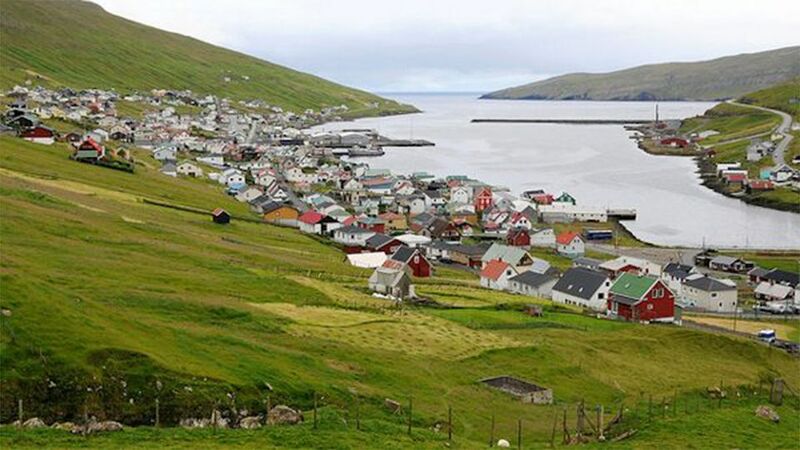 Faroe Islands is running out of women and local men are actively searching for partners from the Philippines. 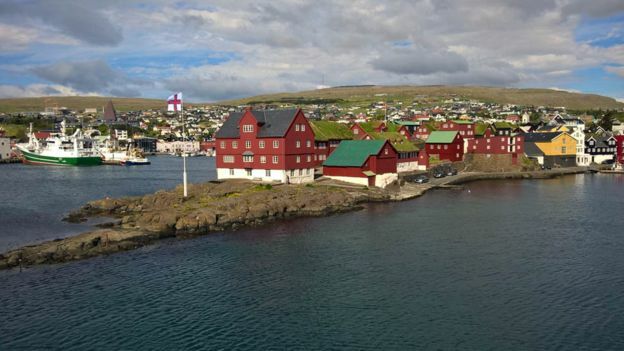 Due to shortage of women in Faroe Islands, a Denmark-based islands located between Norway and Iceland, local men are increasingly seeking potential wives from countries like the Philippines and Thailand. With a humble population of only 50,000 which is further decreasing, there are about 2,000 less women than men in this island. As a result, Faroese men are looking beyond the islands for love. In fact, many of them have found their spouses, mostly Asians, through online dating websites, social media networks and other existing Asian-Faroese couples. Currently, there are over 300 ladies from Thailand and the Philippines thriving in the islands. 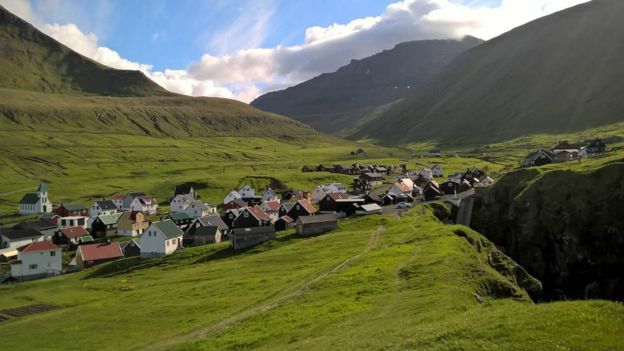 While Faroe Islands may seem like the perfect escape from reality, many newcomers initially found it hard to cope with the islands’ very different weather, landscape and culture. Its wet, cool climate can be very challenging for people particularly from a tropical country as a good summer day could have a temperature of 16°C. In terms of food, Faroese prefer dried cod, fermented mutton and occasional whale meat and blubber. Asians would definitely miss their traditional cuisine as traditional herbs and spices in the region are not available in this area. Moreover, immigrants have to learn the Faroes’ own language which is derived from Old Norse as many villagers don’t speak English. Despite the difficulties of living and adjusting to an entirely different environment, Pinay Antonette Egholm said she didn’t encounter any bad experiences when she moved to the island. MANILA, Philippines - Last year, celebrity couple Judy Ann Santos and Ryan Agoncillo renewed their wedding vows in front of family and friends in a solemn beach celebration at a private beach resort in Batangas on April 30. A year later, renowned videographer Jason Magbanua decided to release a same-day-edit video of the momentous event. Magbanua, who also filmed the couple’s sunrise wedding in San Juan, Batangas in 2009, said there was no way he’s not going to do the anniversary video. 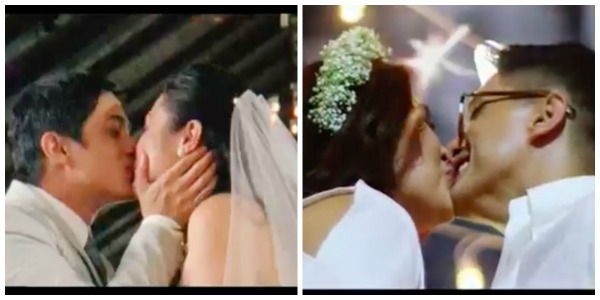 But unlike his usual videos, Magbanua decided to “draw parallels” between the film footages of the actual wedding and the renewal of vows ceremony. “I wanted to key in on the constants in their lives, the people surrounding them, the ones who matter the most, the ones who have been there and are still there,” Magbanua wrote in his blog. Interestingly Magbanua filmed both events in Super 8. “It’s one thing to see Super 8 footage of a wedding shot one month ago, and it’s a totally mind-blowing experience to re-watch the movie clips seven years after. It’s just utterly beautiful, nostalgic, haunting in a positive manner. Indescribable to a degree, transcending pixels,” the renowned videographer revealed. 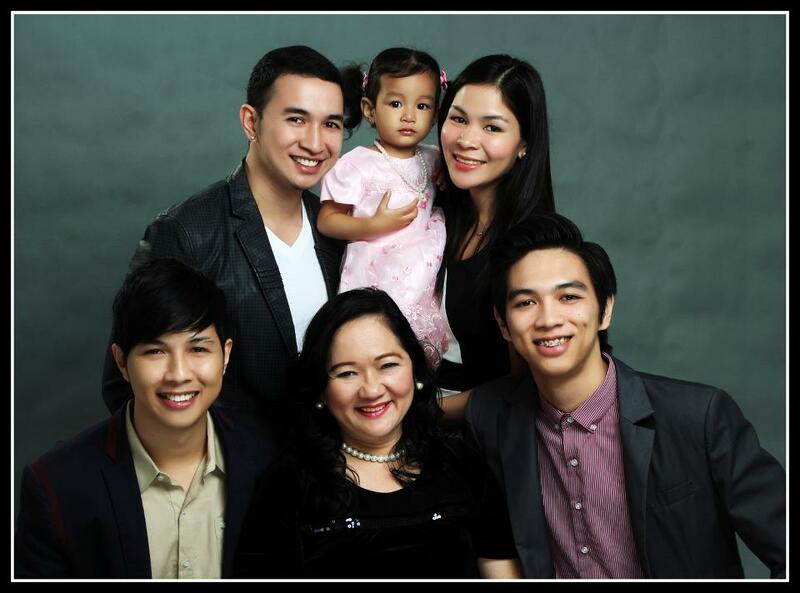 Santos and Agoncillo, who tied the knot in 2009, decided to renew their wedding vows after their son Lucio asked for it. Apparently, the family was watching their wedding video when Lucio noticed that he wasn’t present in the ceremony unlike his older sister, Yohan. “Lucho’s reaction was priceless for me. He wanted to be part of a happy memory that happened prior to his existence. 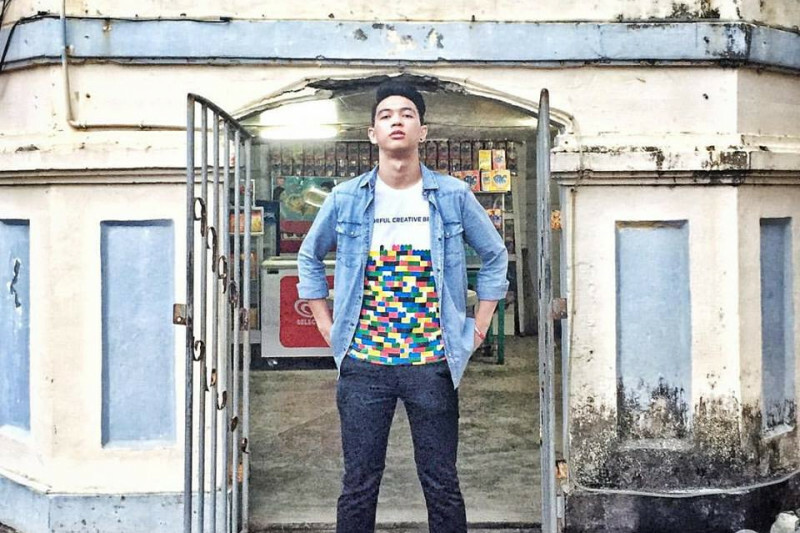 The power of film/video had that effect on the child, much like we all wanted to enter Sesame Street, the Electric Company or Blue’s Clues,” Magbanua remarked. MANILA, Philippines -Tuition-free schooling for academic year AY 2017-2018 will be offered to poor but “academically able” university students particularly those under the student financial assistance programs (Stufaps) as well as those whose households are under the conditional cash transfer program. 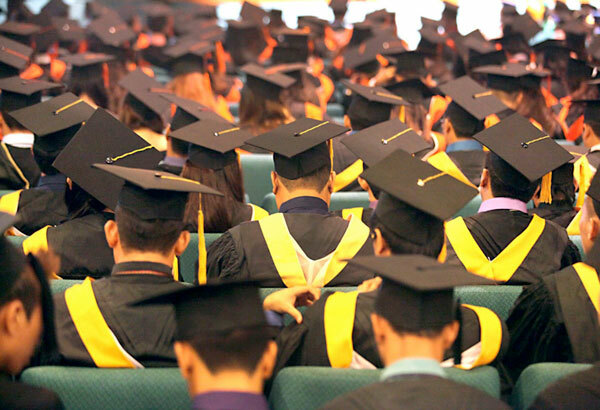 In the April 20 memo released by the Commission on Higher Education and the Department of Budget Management, details of how the grant of the free tuition offered in 114 state universities and colleges (SUCs) were outlined. The said guidelines aim to ensure proper implementation of the special appropriation of P8 billion subject to the conditional implementation that President Rodrigo Duterte earlier ordered. According to the guidelines, only students who are “academically able” or those who pass the academic and retention standard of the SUCs will be granted tuition-free schooling for the new academic year. Moreover, Stufap beneficiaries will be prioritized on enrolment. Given that the total annual benefit amount of these grants is more than P15,000, Stufap beneficiaries’ tuition will be charged to the relevant allocation of the Stufaps. Those whose total annual benefit are equal or lower than P15,000 will be charged to the “free tuition” allocation of the SUC. They will continue to get their regular Stufap on top of the tuition subsidy. Undergraduate students whose households are current or former beneficiaries of the Pantawid Pamilyang Pilipino Program (4Ps) and the Listahan 2.0 program of the Department of Social Welfare and Development will be included in the “free tuition” slots. Regardless of household per capita income, graduating students with one semester and one academic year remaining will be granted free tuition. In December 2016, Duterte subjected the P8-billion free tuition program under conditional implementation. “Yet, as with all new programs, there is a need to safeguard the proper implementation of the provision of free tuition fee. It is important to underscore that we must give priority to financially disadvantaged but academically able students,” Duterte said. MANILA, Philippines - Samsung Electronics Philippines Corporation celebrated in a grand fashion the official local launch of its newest flgship smartphones, the Samsung Galaxy S8 and S8+, at the pop up event zone Samsung Infinity Hub in Bonifacio Global City, Taguig on Thursday, April 27. Brand ambassador Solenn Heussaff and the Samsung big bosses officially unveiled the Galaxy S8 and S8+ in the Philippines. While Samsung included a number of powerful features in its flagship smartphones, Galaxy S8 and S8+ uniquely and proudly own the Infinity Display. The Infinity Display boasts of an incredible end-to-end screen that spills over the phone’s sides, forming a completely smooth, continuous surface with no bumps or angles – only pristine uninterrupted glass flowing seamlessly into the aluminum shell. Visualizing the Galaxy S8’s sophistication and the Infinity display’s revolutionary elegance, Samsung transformed what was previously an empty parking lot near Uptown BGC into a space that immersed guests in the world of infinity. Surrounded by mirrors, bright lights, and swatches of black and white, the venue exuded limitlessness. Up front, the stunningly eye-catching facade of mirrors became the subject of countless photos of both guests and passers-by. Taking a step inside, guests were welcomed with awe as the Infinity Room appeared like a vast galaxy of stars. Tonight and onwards, we set the bar higher. With Samsung, we will no longer be bound by limits and barriers,” says Rhinn Piczon, Business Unit Head for IT & Mobile, Samsung Electronics Philippines Corporation. Host extraordinaire Tim Yap with Rhinn Piczon, Business Unit Head for IT & Mobile, Samsung Electronics Philippines Corporation. The event was hosted by its brand ambassador, loyal Samsung user, and multi-hyphenated artist Solenn Heussaff. The gorgeous and witty Solenn Heussaff. While everything wer eye-catching, the true stars of event cannot be ignored - the Samsung Galaxy S8 and S8+. Samsung’s well-loved camera still made itself prominent as guests made use of the displayed phones to capture the memorable moments of the night. Other celebrities flocked to see Samsung’s latest innovation and support the official launch. This includes Bianca King, Bianca Gonzalez, Christian Bautista, Miss Internation 2016 Kylie Verzosa, Alice Dixson, Heussaff's husband Nico Bolzico and Tim Yap to name a few. Pre-order the Galaxy S8 or S8+ starting April 17 to April 29, and choose from the available colors – Midnight Black, Maple Gold, and the new Orchid Gray. Samsung Galaxy S8 official price is Php 39,990 while the S8+ is priced at Php 45,990. These will all be available starting May 5 in all Samsung Experience Stores and accredited dealers. Planning to spray that expensive cologne to win the girl of your dreams? Here’s a dating tip for men: Garlic, considered as one of the stinkiest food in the planet by many people, can help you get more success with the ladies. In fact, a 2015 study proved that eating garlic actually makes you smell more attractive to ladies. Based on the findings of researchers from the University of Stirling in Scotland and Charles University in Czech Republic, the sweat of men who consume more garlic were found to captivate women. To arrive at this conclusion, researchers asked 42 men in rotation to consume raw garlic, garlic capsules and no garlic. They then instructed them to wear pads in their armpits for 12 hours to collect body odor. Afterwards, 82 women were asked to smell the odor samples and judge them based on attractiveness, masculinity, pleasantness and intensity. Researchers believe that this peculiar preference was developed by ladies because the smell of garlic, a highly nutritious food which has antibiotic, antiviral and anti-fungal properties, suggests that the person is healthy. It is also possible that garlic, which helps reduce the incidence of colds, high blood pressure and even cancer, makes the armpits smell sweeter by decreasing the density of microbes causing nasty odors. “As the health benefits of garlic consumption include antioxidant, immune-stimulant, cardiovascular, bactericidal, and anti-carcinogenic (anti-cancer) effects, it is plausible that human odour preferences have been similarly shaped by sexual selection,” the researchers concluded. Studies in the past have shown that eating of garlic can influence the odor of human breast milk. Consuming garlic increases the time infants spend on their mother’s breast and causes them to feed more forcefully. 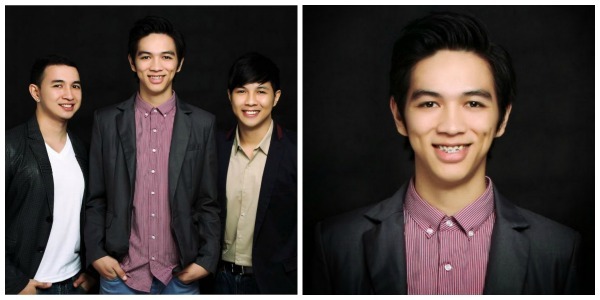 MANILA, Philippines - In a cruel twist of fate, liver cancer has taken the lives of Hisham “Moi” Go’s two brothers Rowden and Hasset. Years after his siblings’ untimely passing, Moi is facing the very same ordeal his brothers failed to overcome. Moi, a 27-year-old man who works in a financial firm, was diagnosed with the same liver cancer his brothers suffered from last February. Despite undergoing regular blood screening and MRI to monitor his liver as well as taking maintenance medicine that roughly costs about P400 a day, Moi seemed to have suffered the same fate. “Doctors found a 3cm in diameter tumor in my liver, as well as several nodules spreading around it. It is the same liver cancer my brothers suffered,” Moi wrote in his GoFundMe page. As a short term solution for his tumor, doctors suggested that he either go through surgery, RFA or TACE which will cost about P150,000 to 200,00 per session. Moi has to undergo about two to four sessions in a year depending on how aggressive his cancer is. Eventually, Moi needs to undergo liver transplant which cost about P5,000,000 at the Philippine General Hospital. Although Moi and his family faced a lot of trials during the past years, he remains positive that he will overcome the disease that took away his brothers’ lives. “I am very positive that I will defeat this little devil by staying faithful to my Lord and God, Jesus Christ. I also have no shortage of encouragement from people I hold dear. I'm keeping an open mind in terms of medication and what approach to take in treating this,” Moi said. In May 2014, Rowden, 29, was diagnosed with stage IV liver cancer and was only given three weeks to live. Since he didn’t experience any symptom weeks prior to the diagnosis, their family was caught off guard. Still, Rowden managed to fulfil his promise and marry his fiancé in the hospital. Merely 10 hours after they said their “I do’s”, Rowden passed away. A video of the heartbreaking moment went viral on social media. A month following Rowden’s passing, his family decided to undergo tests to screen for possible cancer or blood defect. 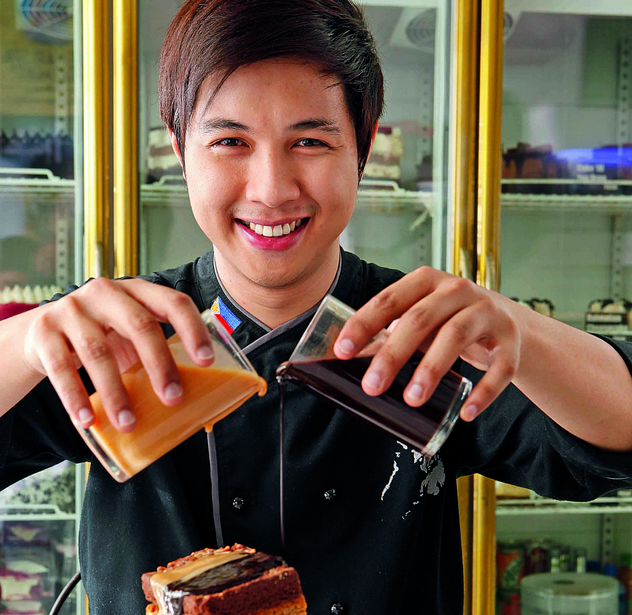 Hasset, who was a 29-year-old chef at that time, was also found to have the same type of liver cancer. Although he went through surgery to have the tumor removed in his liver, it recurred prompting him to try alternative medication and eventually chemotherapy. But in October 2015, Hasset, just like Rowden, succumbed to cancer. Currently, Moi has already raised over $17,000 in just one month. However, it’s still a long way from the $150,000 goal. If you wish to donate and help Moi, visit his GoFundMe page. 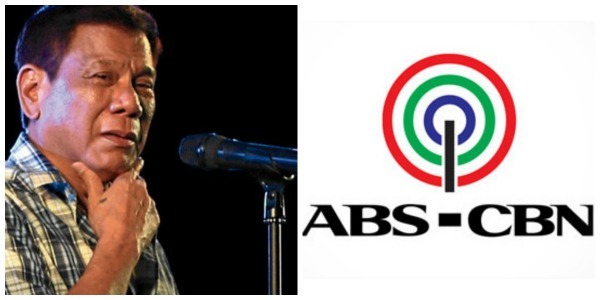 MANILA, Philippines - President Rodrigo Duterte’s earlier threat against TV network giant ABS-CBN may soon come true after he expressed his intention to block the renewal of its franchise on Thursday, April 27. In a media interview, Duterte accused the Lopez-owned company of “swindling,” saying that it did not air his political ads during the 2016 campaign season even if they were already paid for by his campaign team. “[The franchise] has been there for 25 years. The law said it’s okay, only if you adhere to journalistic standards. What did you do to us? Estafa, swindling, not only me but Chiz Escudero, many of us. Son of a b*tch, you collected outright then you commit estafa,” Duterte told reporters. Duterte's strong statement against ABS-CBN comes shortly after he extended the franchise of the network’s toughest rival, GMA 7, for the next 25 years. A report by Business World revealed that Duterte signed the Republic Act (RA) No. 10925 granting the renewal of franchise of the said TV network last April 21. According to the President, he would file a complaint against the network and urge the Congress not to renew its franchise. As of this writing, House Bill 4349 which seeks to renew the franchise granted to ABS-CBN for 25 years is at the committee level. Duterte has been vocal in raising his complaints against the media giant whom he accused of biased reporting. Just last month, Duterte warned “rude media”, citing ABS-CBN, of karma. “Tingnan kung magslant. Ewan ko ba. But someday – hindi ko tinatakot – but someday, 'yung karma, dadating ‘yan,” Duterte said during a public address on March 30. ABS-CBN chair Eugenio “Gabby” L. Lopez III simply brushed aside Duterte’s negative remark against his company. “Let me just say, we have not yet encountered an administration that at one point or another had not had some issue with the media in general, and ABS-CBN in particular,” Lopez said. Are you ready for Uber’s flying taxis? Ride-hailing service Uber Technologies Inc. will soon revolutionize travel as it aims for the skies with its flying taxis. During Uber Elevate Summit in Dallas on Tuesday, Chief Product Officer Jeff Holden revealed that the company will be launching its flying in taxis in Dallas-Fort Worth, Texas as well as Dubai by 2020. Aiming to cut down travel time, Uber’s flying taxis will be small, electric aircraft which can take off and land vertically with zero emissions. Unlike typical helicopters, these flying taxis will be quiet enough to operate in cities. 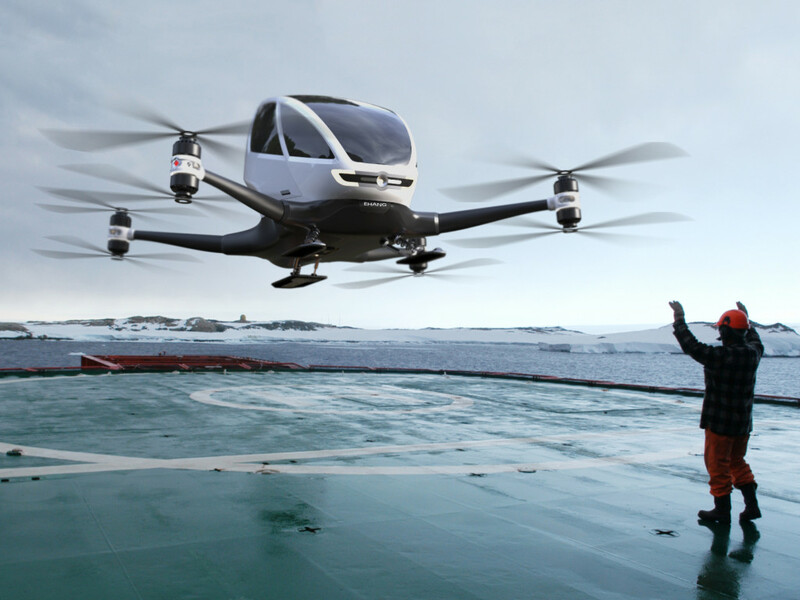 The ride-hailing service has already teamed up with companies like Mooney, Aurora, Pipistrel, Embraer and Bell Helicopter to manufacture flying taxis. It is also working with ChargePoint Inc, a US electric vehicle charging station, to come up with an exclusive charger for its network. Furthermore, Uber has teamed up with Hillwood Properties for four vertiports with multiple takeoff and landing pads as well as charging infrastructure. It is estimated that Uber can get $1.32 per passenger mile during early scale operation. But in the long run, the company expects the cost of riding flying taxis will be the same as riding cars. Still, the company must be able to convince passengers as well as aviation authorities that the untested technology is safe. Uber, which is valued at $68 billion, has recently been rocked by a number of controversies such as accusations of sexual harassment from a former female staff and a video showing Chief Executive Travis Kalanick scolding an Uber driver. 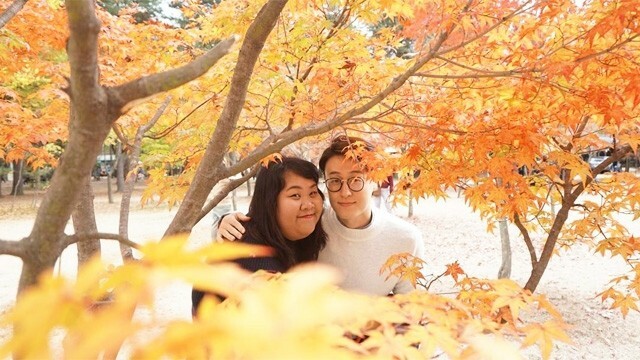 Are you one of those ladies who fantasize marrying their ultimate Korean crush? Nothing is impossible when it comes to love. This was proven by Vera Nanda Putri, an Indonesian woman who recently tied the knot with the Korean man of her dreams. So how exactly did Vera find the love of her life in an unexpected time and place? Apparently, Vera has long been fascinated with the Korean culture. After watching the variety show Running Man, Vera took interest in learning the Korean language. In 2015, she went to South Korea and enrolled in a language course at the Seoul National University. It turns out, Korean language wasn’t the only thing that she’ll learn during her stay. As fate would have it, Vera would meet graphic designer Jun, her future husband, a year after she arrived in South Korea. Many doubted that their relationship would work because of huge differences in culture, traditions and religion. But over the time, the unlikely pair realized that they love each other and eventually became official. Still, the two were ridiculed after sharing their relationship on social media and the public. Unfazed by these issues, Vera and June remained strong and positive about their relationship. They proved their detractors wrong when they decided to take their relationship to the next level and get married. The couple even traveled from South Korea to Jakarta so Jun can officially propose to Vera in front of her parents and family. Last February 28, 2017, the couple said their “I do’s” in a unique ceremony that unified both South Korean and Minang traditions and customs. Their wedding was celebrated by their families and friends. Even Former Indonesian President Susilo Bambang Yudhoyono and his wife Ani Yudhoyono attended their big day. Pursuant to Board Resolution No. 01 – 2017, appending professional title "LPT" will give an impression that the bearer is a bona fide registered and licensed professional. The application wil be the same with other recognized professional titles such as MD for Medical Doctor, RN for Registered Nurse, Engr. for Engineer, RPT for Registered Physical Therapist, to name a few. According to Republic Act No. 7836, otherwise known as the Philippine Teachers Professionalization Act of 1994, it is punishable for any person to practice the teaching profession in the Philippines without having been registered and licensed to engage as such; or to, in connection with his/her name, otherwise assume, use or advertise any title or description tending to conveyor which conveys the impression that he/she is a teacher without holding a valid certificate for such purpose. "Any person or individual who uses and appends such title to his/her name but is not in fact or found not to be a duly registered and licensed Professional Teacher shall be meted with the corresponding sanctions as prescribed in the General Penalty Clause of R.A. No. 7836, as amended," PRC said. 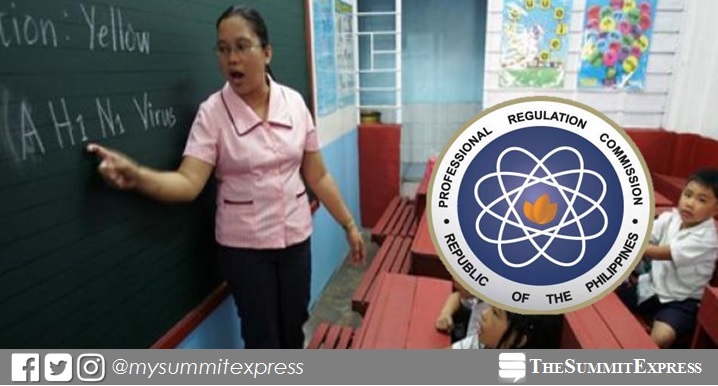 MANILA, Philippines - The Professional Regulation Commission (PRC) officially announced on Tuesday, April 25, that 994 out of 2,213 (44.92%) Registered Electrical Engineers (REE) and 1,817 out of 3,130 (58.05%) Registered Master Electricians (RME) successfully passed the Electrical Engineer board exam given by the Board of Electrical Engineering in Manila, Baguio, Cagayan De Oro, Cebu, Davao, Iloilo, Legazpi, Lucena and Tacloban this April 2017. PRC has recognized Batangas State University (BatSU) as the top performing school in the April 2017 Registered Electrical Engineer (REE) board exam. BatSU got 88.31% or 68 out of 77 passed the exam. It was followed by Mapua Institute of Technology (MIT) with 81.13% or 43 out of 53 passed. Meanwhile, De La Salle University (DLSU) - Lipa was hailed the top performing school in the RME board exam, 100% passing rate or all 69 examinees passed the test. Sorsogon State College, Batangas State University (BatSU), Technological University of the Philippines (TUP) - Manila and Bohol Island State University (BISU) - Tagbilaran are among the top schools. MANILA, Philippines - RESULTS ARE OUT! The April 2017 Electrical Engineer (REE) board exam and Registered Master Electricians (RME) board exam results are officially released today, April 25, 2017 or in 3 working days after the exam. The complete list of passers, top 10 (topnotchers), top performing schools and performance of schools are available on this page as released by the Professional Regulation Commission (PRC) and the Board of Electrical Engineering. 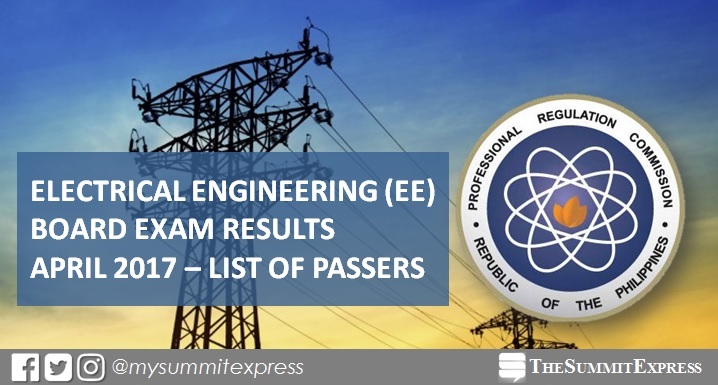 UPDATE: 994 out of 2,213 Registered Electrical Engineers and 1,817 out of 3,130 Registered Master Electricians successfully passed the Electrical Engineer Licensure Examinations. The first Electrical Engineering board exam this year was administered on April 18 and 19 (REE) and April 20 (RME) in the cities of Manila, Baguio, Cagayan de Oro, Cebu, Davao, Iloilo, Legaspi, Lucena and Tacloban. According to PRC, the target release date of the recent Electrical Engineer board exam results is on Tuesday, April 25 or in 3 working days after the series of exams. In April 2016 exams, results were released in 3 working days. PRC named 808 out of 1,957 Registered Electrical Engineers and 1,633 out of 2,914 Registered Master Electricians who have successfully passed the the Electrical Engineer Licensure Examinations. In April 2015, results were announced in just 2 working days. A total of 884 out of 1,886 Registered Electrical Engineers and 1,134 out of 2,705 Registered Master Electricians successfully passed the exams. All takers (passers, removal and those who have failed on the exam) may verify their exam ratings online in few days after the release of results. It will be available here: http://www.prc.gov.ph/services/?id=41. Just follow the instruction and fill in required information in the appropriate fields to verify your identity.